hard starts at a light, driving way too fast, too high RPM's etc. inefficient use of gasoline in the vehicle. Packaging is out of control ,why do I need a bag in a box? Just put food ina bag like chips. A few years ago, 3 yo be exact we had to get a new toaster to replace one we got for a wedding gift in 1970. A Toast Master 2 slicer. We knew one element was burned out and could not find any small appliance repair shop or home based business. So since then we have had 2 pieces of junk, a Black and Decker and has Sunbeam toaster. we will in all likelihood need another one soon. I have checked out Consumers Report and it seems the best cheaper toaster is a. Cuisinart 2-slicer So Amazon here I come. We live in a disposable world for almost everything. In fact I still am using for web connection an old and kept my old iPhone 4s as a back up. All three were hand me downs from our daughter. We have been buying margarine in reusable Rubbermaid storage containers 3pound size and we use them as freezer and dry storage containers. The margarine tastes very good. Always looking for foods we use in reusable containers! look at the obesity rates in N/A and it is astonishing.! I meant water, but you bring up a good point, we did not have a lot of soft drink but when my parents did get it they used the pop shop. You returned your empties for full bottles. They had all kinds of flavors. Even chips we used to get them once and a while from the Fiesta chip man, it came in a can. The chips themselves were in a plastic bag but it was in a returnable can. It was a big deal to get chips a rare treat. My brother and I used to use my mom's wooden clothes pegs to make the roads so we could drive his dinky cars through them. We used to walk to Decelles pool and swim for a couple of hours for a dime. They had a really high diving board that my brother would always jump off of, he was 7. Imagine that now a day, a 7 and 9 year old walking to a pool by themselves and then jumping off of diving boards. 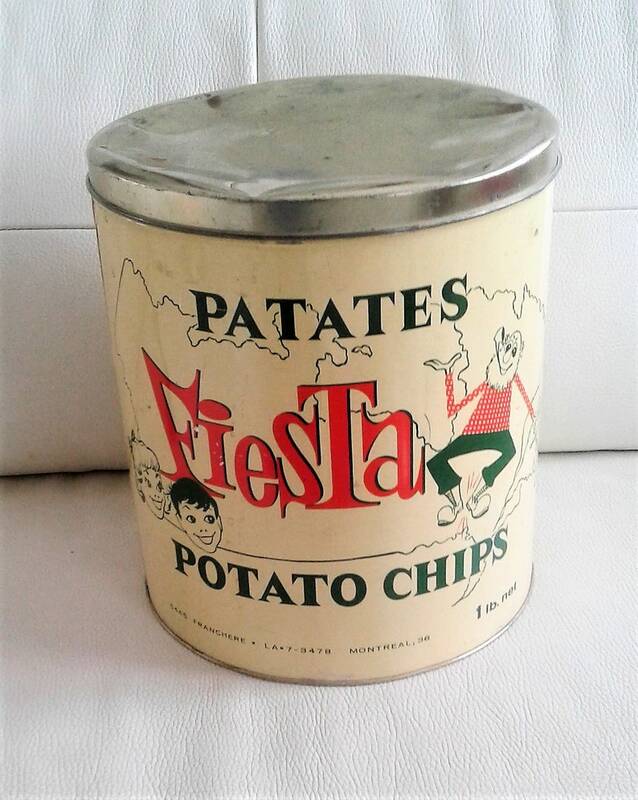 Fiesta chip tins were da BOMB! Yes!!! Funny story I was telling my husband about these chips and what a big deal they were for us and somehow he managed to find one at a flea market he paid $40.00 for that can and brought it home as a surprise for me. I have it on display..oh the memories! Your right cars were not as efficient, however I think it was used a lot less back in those days, as I pointed out our parents did not drive us anywhere, we walked or biked. So I think cars are more efficient today but most households have 2 and they are chauffeuring the little darlings everywhere. it's not just the vehicle, it's HOW you drive it too. you can have a very efficient vehicle but if you drive it hard and always floor it on every light and stop sign and get up high on the RPM's you're wasting fuel as well. A lot of structures make it very easy for North Americans to be exceedingly irresponsible with consumption choices. For example, waste collection and disposal is hugely subsidized. Taxpayers pay virtually the entire cost of collecting and landfilling waste, which creates no incentive whatsoever for low packaging consumption. Roads are pretty well entirely subsidized, so there's no incentive not to drive. Even with carbon taxes in place, fuel is hugely subsidized, so there is no incentive not to use it. Water and sewer are heavily subsidized, so no incentive not to consume there. Without any incentives to make responsible decisions, people make irresponsible decisions.